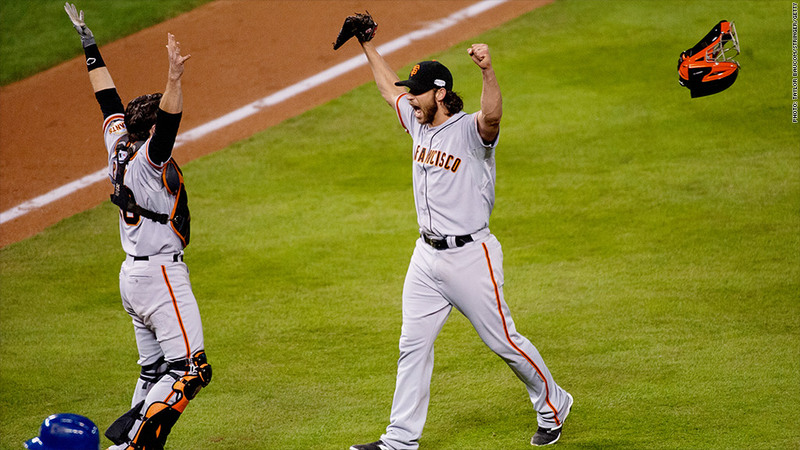 After game 7's ratings, Fox should be celebrating like the San Francisco Giants. While game 1 of the 2014 World Series struck out in the ratings, game 7 was nothing less than a home run for Fox. Wednesday night's deciding game -- which saw the San Francisco Giants beat the Kansas City Royals 3-2 -- brought in an average of 23.5 million viewers. That total almost doubled last week's historically low-rated game 1, which only brought in 12.1 million viewers. It also made Wednesday's match-up the highest rated World Series game since 2011. Game 7's usually bring big ratings, but Wednesday's numbers may have had an extra lift thanks to a close game and a legendary pitching performance by the Giant's Madison Bumgarner. Viewership grew as the broadcast went into the night, with 27.8 million tuning in towards the end of the game. Over the seven games of the series, the Fall Classic averaged 13.8 million viewers -- down from 15.2 million this time last year, but up from 12.7 million two years ago. Fox enjoyed victories in the key 18- to 49-year-old demographic six of the seven nights it aired. The ratings victories were surely appreciated by Fox after a rough start to network's fall slate of programming.